Our previous article explaining Day Types looked at the Day Type classification as explained by Market Profiling. This article is going to examine the statistics of how often a particular day type happens with the S&P500 E-mini futures contract (ES). Looking at how often a particular day type happens allows us to customize our trading strategy to the characteristics of the instrument we are trading. For example, certain instruments will have far more trending days than normal days. For these instruments, a trend-following trading strategy will likely work better than others. While mean-reversion instruments will have more normal/normal variations days than other instruments. To set this up, I created a NinjaTrader strategy that calculates the Day Type (details explained below) and then outputs the type to an Excel spreadsheet. I ran this strategy over the last 2 years of ES data with Kinetick as the data provider (Which gives 2 years of intra-day time-based data). Non-trend Day: IB Range < 5 and neither IB side is broken. Neutral Day: Both IB sides are broken and we close inside the IB Range. Neutral Day Extreme: Both IB sides are broken and we close to one extreme. I also added 2 more day types based on the results I was getting. Narrow Day: Has an IB Range < 5 but 1 or both IB Sides are broken. Unknown Day: Just a catch-all to make sure I didn’t miss a day or ran into one I didn’t expect. As we can see, the biggest day type for the ES is the Normal Variation at 54%. 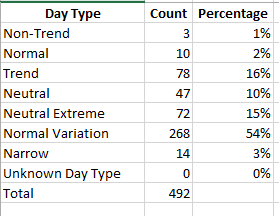 Trend Days have been happening about 16% of the time while the Neutral Days (Both Neutral and Neutral Extreme) account for 25% of the days. This definitely tends to give evidence to the statement that the ES is more of a mean reversion instrument. 4 out of 5 days you will get a move back and in 1 out of every 4 days it will revert back so much it will break the other IB side. However it is important to note that the ES averages almost 1 Trend Day per week. Example: Do Trending days happen more often in Bullish or Bearish markets? Thanks so much! Glad that you find the information useful! Thank you for doing this, is it possible for you to share the strategy you wrote for NInjaTrader?